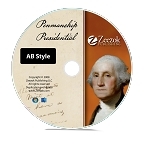 Presidential Penmanship™ is a supplemental handwriting skills program for first grade through senior high based on writings and quotes of America’s founding fathers and presidents. This program will expose your student to the governmental principles and moral qualities that made America a great nation. Each grade level includes extra lined pages to print out should the student need additional space or extra practice. First and second graders learning manuscript copy thirty-six quotes focusing on the founding principles of the United States and character qualities such as honesty and hard work. Quotes chosen for the primary level are short enough to memorize, laying a foundation for future history and civics instruction. Third and fourth graders learning cursive copy slightly longer quotes by our nation’s Chief Executives, as well as passages from speeches by Patrick Henry, Thomas Paine, Thomas Jefferson, James Madison, Andrew Jackson, Abraham Lincoln, Theodore Roosevelt, and Franklin D. Roosevelt. The third and fourth grade practice books include 108 skill-building lessons for practice three times per week for thirty-six weeks. The program continues in sixth grade with slightly longer presidential quotes and a “final exam” in which the student copies the Gettysburg Address. The junior high and senior high levels start with shorter quotes and progress to paragraph- length passages near the end of the course. Selections include sections from the Declaration of Independence, Lincoln’s First and Second Inaugural Addresses, the Gettysburg Address, and Reagan’s First and Second Inaugural Addresses—great for memorization as well as handwriting practice.